When you're a smartphone startup competing in a world dominated by Apple and Samsung, how do you stand out? You go out of this world. For last month's launch of the OnePlus 3—the third flagship smartphone created by OnePlus—the China-based company created a virtual reality experience that brought viewers to a space station where they could learn about the latest features of the flagship phone. Around 60,000 people tuned in, and within the first hour, 10 percent of those who viewed the video bought a phone. Within six hours, the conversion rate had grown to nearly 30 percent. That might sound like a small sum in an era of YouTube videos that reach millions, but the initiative could provide a glimpse into the future of virtual shopping. When users put the headset on, they see a rendering of the OnePlus office in China. But when they enter, they see a note that says the company has moved. Soon, they're taking an elevator that takes them up to the space station. There, there are four rooms, each featuring one characteristic of the phone. For example, one describes the phone's "dash charge" feature, which provides a day of power in a half hour. Another focuses on the camera, while another features the design. "For us, VR is a way of connecting emotionally with our fans," Carl Pei, the co-founder of OnePlus, said in an interview. "Because when you're put into this really immersive experience, you can't help but have an emotional connection to this. That's why we wanted to be first with the global shopping experience. We think VR is going to be a very big deal in the future, and that's why we wanted to plant these flags." 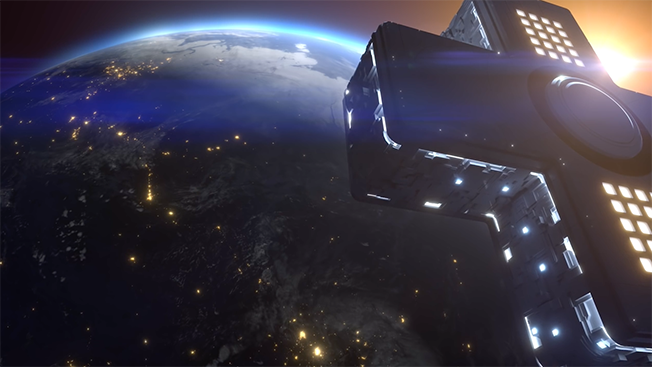 Before the launch, OnePlus released a trailer previewing the outer space office. While this was the biggest VR endeavor for OnePlus, DigitasLBi Nordic has done a number of projects for other brands including Audi and Volvo. According to Nordics creative director Rasmus Frandsen, the idea for the OnePlus movie was inspired by 2001 Space Odyssey, but also by M.C. Escher, a dutch graphic artist whose mathematically inspired drawings often questioned accepted perspectives of geometry. Up wasn't always up and down wasn't always down. Just like the main room of the OnePlus space office. "It's VR, so let's go crazy on the up and down," Frandsen said. "Delivered, it almost feels totally random and inspired by popular sci-fi." Unlike some other brands' first virtual reality commercials, the video was created with CGI rather than solely shot in 360 degrees. The team scanned around 150 people, some employees and some friends. "It's always been about creating value for the user," he said. "Building tools that are cool and things like that. So it's providential for us to do something that's cool for the user and then product secondary." Back on Earth, the OnePlus 3 has received plenty of accolades from a number of real-world reviews. Forbes said it's "so good" that anyone paying double for one of the bigger brands should think twice. Wired called it a "true flagship phone with style and power." The Verge recommended it "without reservations." The day after the launch, OnePlus organized pop-up stores in seven markets around the world including the U.S., the United Kingdom and India. By the end of the day, OnePlus sold out of the 1,000 phones stocked in each of the one-day store. Some customers in Paris waited in line for as long as 10 hours for a chance to go inside. According to OnePlus Chief Marketing Officer Kyle Kiang, the company historically hasn't spent much money on marketing, focusing instead on building community via message boards, word-of-mouth and organic search traffic. However that's beginning to change. For this phone's launch, spending has been "below the low six figures." OnePlus wouldn't say how many phones they've sold so far, but if it's going to compete with Apple and Samsung, it certainly has a long ways to go. According to a May report from Gartner, Samsung led the way in global market share in the first quarter with 23.2 percent, followed by Apple's 14.8 percent and Huawei with 8.3 percent. "I think in a lot of ways we're a pretty unconventional story," Kiang said. "From a consumer standpoint, we've had a lot of initial traction from consumers in global markets—Europe, India, North America—and so I think those are really the consumers that have driven us forward. I think in a lot of ways we're still pretty unconventional and nontraditional and in a lot of ways still a startup."